← Trails, Urban Trails and Roads. 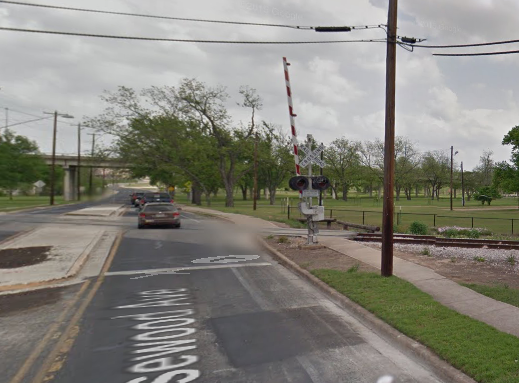 We recently looked at some crossings on the Cap Metro Red Line Metro Rail with the intent of determining which ones needed work to make them safe for cyclists. 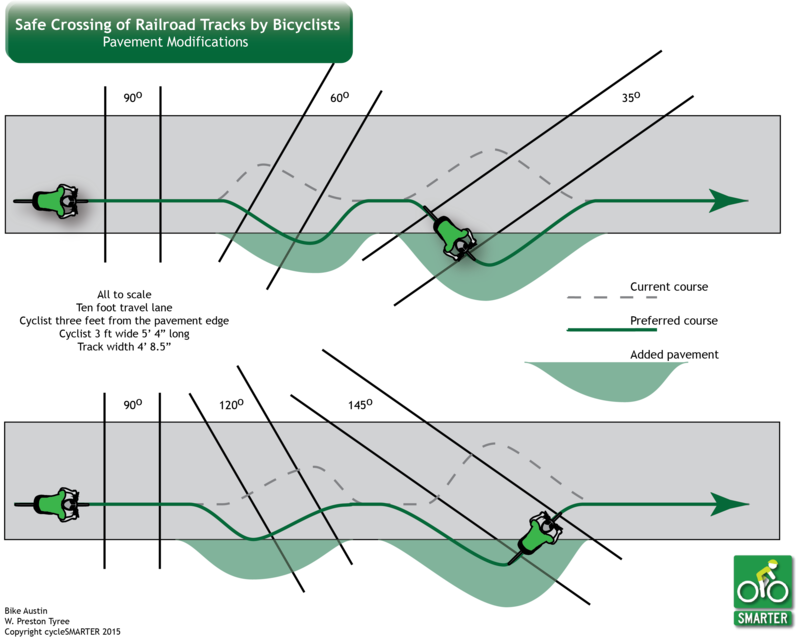 When rails cross perpendicular (at a right angle, square) to the line of travel it is relatively easy for a cyclist to traverse them safely. However, as the angle begins to change then a cyclist crossing the tracks has to begin to take some precautions. This is particularly true when the tracks and road are wet. Turns out the Metro Rail line is a good case study with some widely varying angles. There are two ways to deal with angled crossing; the first is to have the cyclist veer into traffic before or after squaring up to make the crossing, while the second is to add pavement to the side of the crossing so the rider can make the crossing square to the tracks but use the pavement to either set up the crossing or to recover after the crossing depending on the angle. I know that is confusing. Take a look at the diagram and you can see that a simple addition of pavement makes the crossing much safer for the bike rider and less harrowing for the motorists as well. The two photos show Rosewood Avenue as it is crossed by Metro Rail. Steep angle suggesting that a bike rider may want to swerve out into traffic to cross back to the right. It would be easy to place a small patch of pavement on the right side after the tracks so a rider could turn to the right, cross the track and still have pavement to turn back into the roadway. This is a route that many children take to get to the parks in the area. (Thanks to Christopher Stanton for pointing out this crossing.) Photos courtesy of Google Maps. This entry was posted in Austin, Facilities and tagged Education, Railroad. Bookmark the permalink. If your path will take you further into the travel lane at any point, and there is traffic behind you, it’s a good idea to look back and give them a stay back signal (such as left hand out diagonally with palm out) on the approach, so discourage them from passing you, especially if your maneuver starts with a swerve to the right. Absolutely John, but if the rail road or other road authority is really working to make the roads safe and convenient for all users they will make changes to keep us out of traffic. Seattle has a very frightening intersection where the suggested route takes cyclists out of traffic when crossing streetcar tracks. Drivers see the bicycle turning off the roadway, speed up to close the gap, and are perfectly positioned to hit the bicycle when it moves back into the road. I find it much safer to stay in the roadway than to dodge off the road and then veer back in front of moving traffic. If you’re going to have infrastructure that has bicycles veering out of the lane and then back into it, you need something that prevents following drivers from thinking that the bicycle is leaving the lane. Otherwise, you’re setting them up for a collision.